This was one of the days I was looking forward to the most. The day I see four infallible Imams, one more oppressed than the other, and yet, they managed to become the great figures that they are today. We were tired, with lack of sleep enveloping us like a warm blanket, however we woke up in the morning, to board our bus. The difference between this journey and the ones to Najaf and Kufah, was security. The likely-hood of us not returning back from this journey was high. Samarra where the tenth Imam, Imam Ali Al-Hadi (as) and his son Imam Hassan Al-Askari (as) are laid to rest, is one of the most dangerous sites of pilgrimage for Shia Muslims. But it is one of the most important places. Imam Ali (as), Imam Hussein (as) and Imam Reza (as) are visited by some forty to fifty million pilgrims a year. They are well known and well looked after. But we must never forget the importance of the other Infallible Imams of the family of Prophet Mohammed (s). By visiting them we assist in spreading their message and cleansing our own souls. The more we visit them, the more we learn from them, the more we learn from them, the closer we get to Allah the Almighty, and the more we attain truth. It being the fifth day, the strain from lack of sleep was showing itself on us. Almost everyone except our bus driver and some others in the front were asleep for the duration of the three to four hour drive to Samarra from Karbala. We would wake up every so often just to confirm we were still on our away, catching glimpse of military check points, as they become more frequent and more manned. Samarra itself was the most military manned area of all the holy cities we had visited so far. I wondered, what danger does the grave of these holy Imams possess to others. They cannot possibly lead a revolt, or direct any military threat to any one? But you realise, the closer you get to these shrines, that it’s not the Imams that others fear, but the message they stood for. The power of the message is greater than the messenger. But how can you destroy an idea that is firstly known by many and secondly is the natural part of all human beings, to know their creator. The Imams suffered more than any one; they were either imprisoned in holes in the grounds of palaces for years, or were subjected to house arrests, with constant intrusions with psychological and physical torture given to them and their respected families. The shrines of Samarra are in a very hostile part of Iraq. Imam Hussein (as) and Hazrat Abbas (as) shrines are in Shia dominated areas, so you feel at least a welcoming or love and respect given by locals to these important personalities. But I can put my hand on my heart and say this was not the case for Imam Hadi (as) and Imam Askari (as), in Samarra. Again these are more reasons why we most go and visit these Imams. It’s only through hardship and effort you prove to your beloved you love them. If everything was easy and comfortable where would be the challenge and the struggle, which the loved one makes to prove his love, and his devotion? Can we be counted as the lovers of the magnificent personalities? Even with making the effort to visit them it’s not enough, we still haven’t proven our love. A learned scholar on our journey reminded us, how much do we know about these personalities and what they went through? What lessons do we take from them, and what do we reflect upon? Is it enough to just know the story of Karbala and Khaybar? Surely if it wasn’t for these lights of Allah, we wouldn’t have come to the point we are now at. That The Guide, the Imam of Our Time, the Saviour of Mankind is the son of these Imams. Do we really love the Imam of Our Time? Do we really want to be his servants, and his aid? Then what do we know about his father, and what his father went through? Do we know any narrations or stories from his grandfather Imam Hadi? This visit to Samarra was more of a wakeup call then a visit. This journey to Samarra opens up our heart to what we have neglected and that is history, and the history moulds the future. We have to wake up and unlock the 12 parts that we need to become complete humans. We have only been looking at 2 parts of this magnificent library of knowledge. We must come out of our comfort zone and venture to learn more. And if you are in doubt as to what I mean by these twelve parts, I am referring to the 12 infallible Imams that Allah chose through his last Prophet Mohammed (s). Allah Almighty, made his message of Islam perfect through these twelve guides. If you doubt this or do not know about it, then you are the one at loss, not the truth. For the truth will last until it is gathered back to its originator. It is impossible to not cry when you see the damage caused by the eight bombs that went off in the Shrine of Samarra. The damage it caused is clearly visible even now. I close my eyes and just see it as if it’s in front of me, and my eyes are filled with tears. The pain of seeing our beloved in this state cannot but break even the hardest of hearts. We call Imam Reza (as), the eighth infallible Imam, ‘Gharibal Ghoraba’, which roughly means, the lonely amongst strangers. But I tell you, the Imams laid to rest in Samarra are more lonely amongst strangers. Kazamain, is a little different. It’s more like Karbala and Najaf. The city has grown around the beautiful shrine, and is more receptive of its guests. 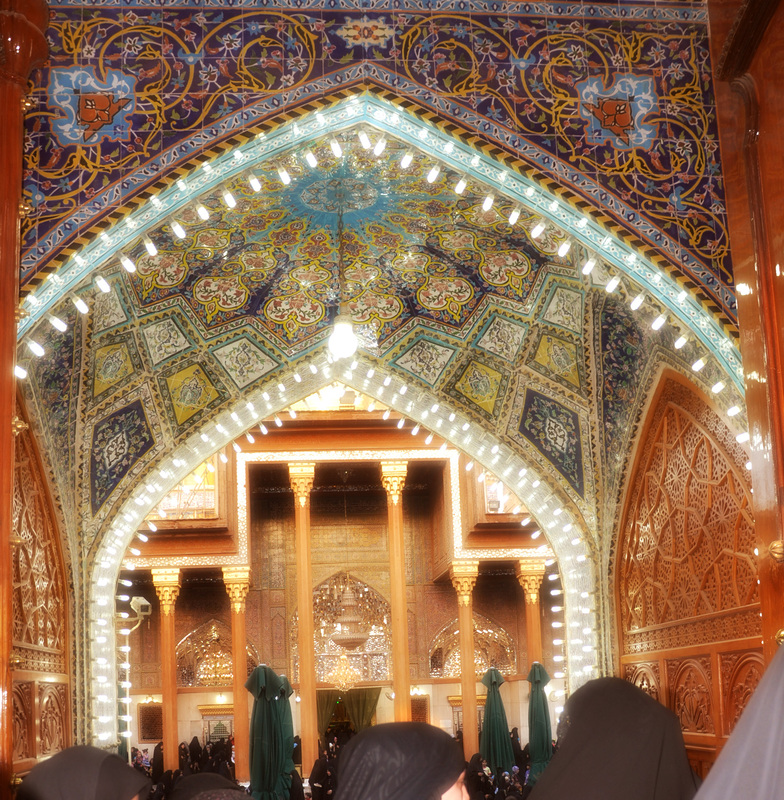 The Shrine of Kazamain looks after the beloved Imam Musa Al-Kazim (as) and Imam Mohammed Al-Jawad (as). This shrine is one of the most beautiful shrines in Iraq. It has a sense of peace about it that Samarra didn’t have. It has two golden domes that no other shrine has and its beautiful palace like design invokes a majesty, which is befitting its hosts. Whatever sadness you feel in Samarra is drained from you in Kazamain, not because Imam Musa (as) and Imam Jawad (as) were any less oppressed. But the hostility felt when you arrive in Samarra is not present in Kazamain, because these two Imams are amongst those that love them. This makes me ponder, how responsible are we? What are our actions toward our Imams who have passed away and our Imam who is alive, waiting patiently to be called. Waiting, watching us, his lovers, from far, sometimes helping, sometimes not. Watching us make our mistakes and the sadness that befalls his heart. Wanting to tell us not to make these childish mistakes, but knowing his place is fixed. His heart full, full from centuries of witnessing injustice in the world. We watch a news item of famine and we become upset for days, and yet our Imam has witnessed, wars, famine, genocide, and such crimes that we haven’t even heard of and yet his heart, is so tender. So ready to receive our call for help, our call for guidance. How much do we value the Imam who is alive and with us, and how much do we strive to get close to him. Instead of wanting him to do all the hard work of showing himself to us and coming to us! Film maker, teller of tales and lover of the fourteen who bring us to He who created us from nothing but earth!